Tom Norton (centre) scored Phantoms' first goal against Streatham. 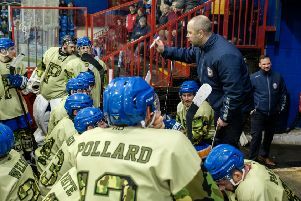 Phantoms head coach Slava Koulikov has declared himself happy with the club’s NIHL Division One South campaign – despite missing out on a first league title in nine years. The city team finished level on points with champions Basingstoke over a 32-game league season and also boasted an identical head-to-head record to the Bison, but lost out due to an inferior goal difference. It is the second time in three seasons that Phantoms have been pipped to glory by Basingstoke in a title squabble. The Hampshire side also beat them to the English Premier League crown in 2015/16. “I’m happy overall with the way the season went,” insisted Koulikov. “We finished joint on points – and on head-to-head record – with the champions. “In the end we lost on a tie-breaker to split the teams which happened to be goal difference. Phantoms were the early pacesetters as they made a rip-roaring start to the campaign, reeling off nine successive league victories before their hot streak was ended on home ice by London Raiders in November. Another slip-up followed the next weekend when Milton Keynes Thunder triumphed on penalties in the city, although Christmas had passed before Phantoms tasted defeat for the first time on the road. They were pipped 5-4 in overtime in Swindon on December 29, but still returned with a valuable point. Their only other losses were at the hands of Basingstoke – both by 4-3 scorelines on New Year’s Day at Planet Ice and in an early February trip to Hampshire. Bison steadily ate into Phantoms’ advantage at the summit after being armed with a stack of games in hand and a two-horse race for glory developed in the final months of the campaign. Koulikov added: “I don’t think we can look back on any one game or situation and say that was the turning point in a whole season. “The sloppy performance and defeat at home to London is the one disappointing night that sticks in my mind. Then there was the next week when we had 70-plus shots against MK and ended up losing on penalties. “We led a couple of times, 2-0 and 3-2, in Basingstoke but lost that game. We had the two-goal lead at home against Basingstoke in our second-to-last game which would have given us the better head-to-head record, but they managed to score a late goal. “You can always look back and find moments that could have been different, or when we didn’t have the luck on our side. “Maybe the fact that Basingstoke played a lot of stronger teams in the second half of the season was a factor as well. We know Swindon started to concentrate on the cups once the gap got too big for them to finish first or second in the league. “We have also seen Bracknell struggle at times after being very strong earlier in the season.